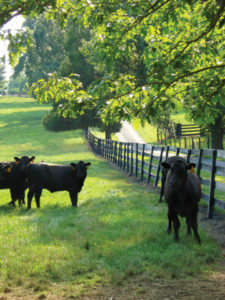 Ironstone Spring Farm has 85 acres of all natural pasture that our cattle love to graze on most of the year. When it snows they are given all natural grass hay, the majority of it having been harvested from our pastures. 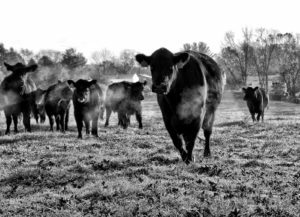 All of our natural grass-fed beef cattle are raised directly on our farm, free of hormones, and antibiotics. The mama cows, baby calves and beef cattle are humanely treated and have free range on our lush delicious pastures. Sheds are provided for them to go into at their leisure when there is inclimate weather. We never force our cattle into confined feed lots or give them growth hormones or grain. As our cattle eat all natural grass, the meat is very healthy for you and your family. It is much lower in fat and naturally provides Omega 3 fatty acids which may help prevent diabetes and heart disease. It is also higher in CoQ10, an enzyme needed for proper heart function and circulatory issues. CoQ10 is also a powerful antioxidant. Grass-fed beef contains beta-carotene, also an antioxidant that helps with immune function. The beef is processed at a local USDA certified processor. Your grass-fed beef is cut to your specifications. It is individually packaged and labeled, and may be picked up at our farm or the butcher. APPROX. WEIGHT of WHOLE STEER 325 lbs. APPROX. WEIGHT of 1/2 STEER 165 lbs. APPROX. WEIGHT of 1/4 STEER 90 lbs. APPROX. WEIGHT of 1/8 STEER 40 lbs. APPROX. WEIGHT of 1/16 STEER 25 lbs. Beef Jerky, Beef Cubes, Hot & Fresh Sausage, Bologna, Soup bones, Marrow bones, and organs. *An optional cut of beef to the New York Strip and Filet Mignon is Porterhouse Steaks and T-Bone Steaks. First, call (717) 575-0110 or email us to place your order. ©2019, Ironstone Spring Farm. All Rights Reserved.